Network Address Translation (NAT) is the ability of a router to translate a public IP address to a private IP address and vice versa. It adds security to the network by keeping the private IP addresses hidden from the outside world. A known issue with Linksys routers is the NAT Type 3 or anything related to dropping of Internet connectivity during play time. Gaming consoles such as Xbox 360®, PlayStation®3, and Wii™ often encounter NAT related issues resulting to poor gaming experience. This problem is resolved by checking the settings on your router which contribute to NAT issues. Sometimes due to the built-in firewall of the router, you will need to open ports. You may do this by either doing Port Forwarding or Port Triggering. Once the ports are successfully opened, the NAT Type will change to Open or Moderate. Thus, making the gaming console work successfully online. When it comes to opening of the ports, you will need to set the IP settings on the gaming console to static to complete the set-up. This procedure will be further explained through the steps below. NOTE: Before checking the router settings, make sure first that your gaming console has an Open NAT when connected directly to the modem without the Linksys router. Open NAT - This means that your gaming console has the ability to connect to anyone’s games, host games, and other users will be able to find and connect to the game you are hosting. Moderate NAT - This means that your connectivity to other players is neither limited nor open. You will be able to connect to other players but some functions will be limited. Strict NAT - This means that you have limited connectivity with other players and players who have Strict or Moderate NAT will not be able to join your gaming session. IMPORTANT: If your DSL modem is NAT capable, it could cause your gaming console to have a Strict NAT type since your Linksys router also has built-in NAT capability. It is strongly recommended that DSL modems be set to a Bridge mode. Why this works: Most DSL modems have the same subnet and IP address (192.168.x.x) as that of your Linksys router. Setting it to Bridge mode will then make the Internet IP address show up as a public address (76.68.x.x) therefore avoiding conflict with double NAT issues on the network. This can be confirmed by verifying the Internet IP address on the Linksys router while it is connected to the modem. Access the router’s web-based setup page. Open any web browser (Internet Explorer, Mozilla Firefox, or Safari) and enter “192.168.1.1” on the Address bar then press [Enter]. NOTE: The default IP address of Linksys routers is 192.168.1.1. To learn how to access the router’s web-based setup page, click here. You will be then asked for your log-in details. Leave the User name field blank and enter “admin” on the Password field then click OK. NOTE: If the default password doesn’t work, you might have changed the password when you ran the setup CD the first time you set up your router. If you forgot the router's password, you need to reset the router. To do this, press and hold the Reset button for 10 seconds using a pen or a paper clip then unplug the router from the power outlet for 30 seconds and plug it back in and wait for the Power LED to be solid. 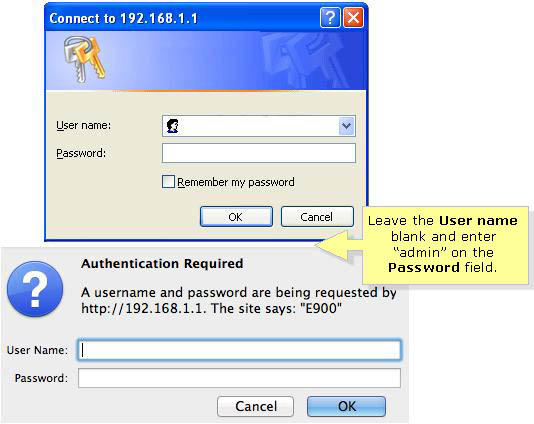 QUICK TIP: Check the Remember my password box to avoid being prompted to enter your password the next time you log in. Scroll down and look for the Configuration Type panel and check if you have a private or public IP address. If you are getting a private IP address, you need to set your modem to Bridge mode. NOTE: Public IP addresses are known as a unique IP address given by ISPs. An example for this would be 76.68.x.x. As for private IP addresses, they are under the same subnet of 255.255.255.0. One example for this is 192.168.3.100. QUICK TIP: Setting up your modem to Bridge mode disables its NAT capability. For more information on how to set your modem to Bridge mode, contact your Internet Service Provider (ISP) or modem manufacturer. If you have Demilitarized Zone (DMZ) enabled on your computer and the modem’s IP address is set to public, this means that your modem is already set to Bridge mode. You may then proceed to checking the IP configuration of your gaming console. NOTE: You may need to reconfigure your Linksys router after setting up your modem to Bridge mode. For instructions on how to configure your Linksys router with DSL Internet service, click here. If you are getting a public IP address, your modem does not have a NAT capability and you may continue with the next procedure. Ensure that the IP address of the gaming console is in range with the IP segment of the network. To check the IP configuration, contact the gaming console manufacturer. Make sure to do port forwarding on the router to allow connection to pass through. For instructions on how to enable port forwarding, click here. NOTE: Alternatively, you can also try using a DHCP-assigned IP address. Make sure that the gaming console is getting an IP address that is in range with the IP segment of the network. To check the IP configuration, contact the gaming console manufacturer for support. Port Triggering or Port Forwarding is a necessary step in setting up an Open NAT network. It allows your router to open ports used for online gaming. NOTE: If you have DMZ enabled on your computer, you may still forward or trigger ports specifically for your gaming console. Port Triggering can open an incoming application port when a client on the local network makes an outgoing connection on a predetermined port or range of ports. Port triggering is ideal for connecting more than one (1) game console to a router. Instructions for setting up an Xbox 360® behind a Linksys router using port triggering are found here. NOTE: It is not recommended to play two (2) Xbox 360® units on the same network connected to the same game server since the modem will only generate a single WAN IP address. However, you may secure another WAN IP address from your ISP to connect the two (2) Xbox 360®. Port Forwarding can open an incoming application port when a server on the local network makes an outgoing connection on a predetermined port or range of ports. This is ideal for game servers. To learn how to enable port forwarding on a Linksys router, click here. To configure port forwarding using your Linksys Smart Wi-Fi Router, click here. Access the router’s web-based setup page and click the Administration tab. Scroll down and check if the UPnP is set to Enable then click Save Settings. Xbox® gaming consoles require a minimum MTU setting of 1365. Linksys routers have the MTU set to Auto by default and you may need to configure it to pass Xbox®’s minimum MTU requirement. To learn more about Linksys routers’ MTU setting, click here. If the above steps do not seem to work, try to upgrade the firmware of your Linksys router. A firmware upgrade will fix bug issues that might cause your gaming device to have Strict NAT. For detailed instructions on how to upgrade your Linksys router’s firmware, click here.